Mizuho has made a matching amplifier for almost every model of MX series handheld issued to date. This is the PL series of amplifiers. The PL-2 amplifier matching the older 200mW MX-2 2m handheld put out five watts, while all other PL series models put out 10 watts. 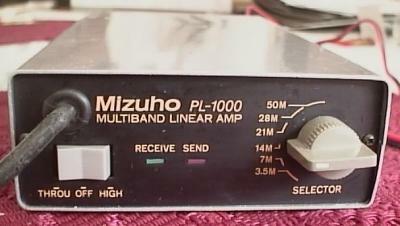 In additon, Mizuho briefly made a multiband (6-80M) amplifier for the ham who has several MX series handhelds. The PL-1000 is extremely rare and sought after. It requires 2W input on 80,40,20,15, or 10 meters, and 1W on 6 meters for a rated 10W output. Actual output power as high as 18W has been measured on some bands. The amp does not work with the older 200-300mW handhelds, which provide insufficient drive power. It also does not work with the MX-18S 17 meter handheld. 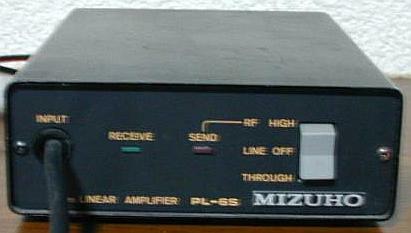 The LA series of amplifiers matched older (1970s and early 1980s) Mizuho gear. At left is the LA-2X, the matching 10W amplifier for Mizuho's SB-2X 2m SSB/CW 1W portable transceiver. More information, specifications, and manuals on LA series amplifiers will be posted shortly.